We Begin With The Bean . 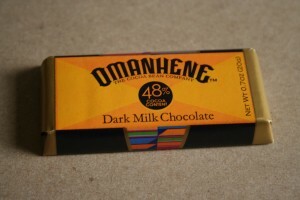 . .
At Omanhene, we go from cocoa tree to finished chocolate bar entirely in Ghana. The process takes around 6 weeks. 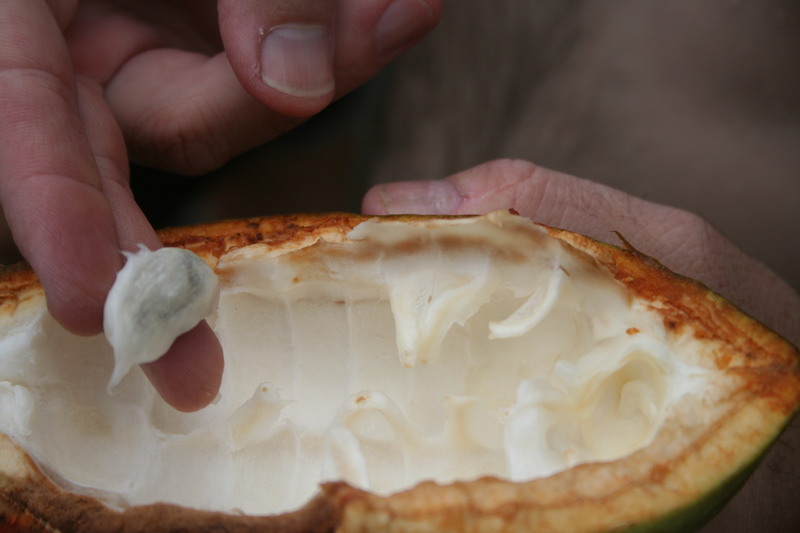 Cocoa beans are actually seeds found inside a cocoa pod. Cocoa bean fresh from the pod. 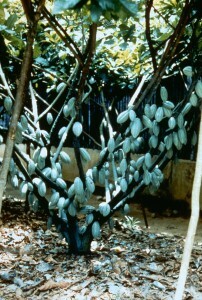 There are perhaps two dozen cocoa beans in each pod. 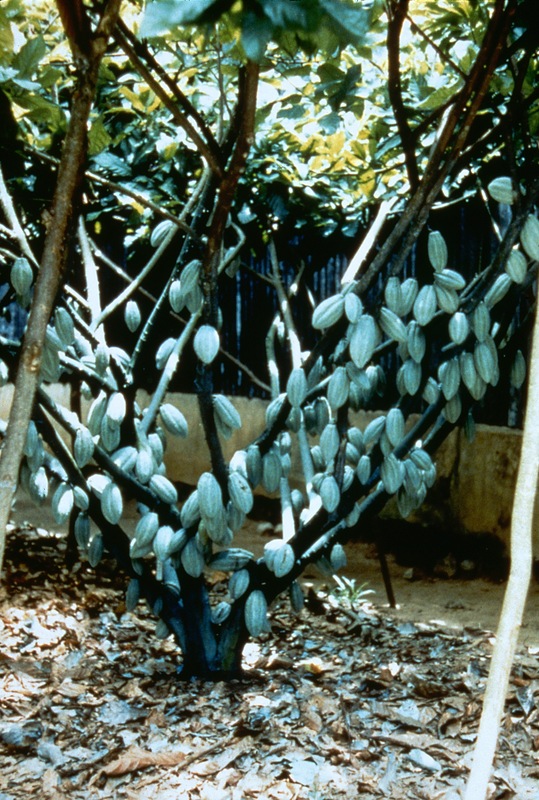 The pods grow on cocoa trees (taxonomic name: Theobroma cacao) which are relatively small — about the size of a typical apple tree. Each cocoa tree can produce anywhere from 60 to 80 pods or more, if the tree is pollinated by hand — a meticulous process that increases yields substantially. Two crops are harvested each year in Ghana, so fertile is the soil and hospitable the climate. Cocoa, which is sometimes referred to as cacao is not to be confused with the coca tree. The cocoa beans are harvested and then placed in small mounts interleaved with palm fronds right on the forest floor to begin a process of what is termed fermentation — a two week period during which the moisture content of each cocoa bean is slowly reduced and the flavor is thereby concentrated. 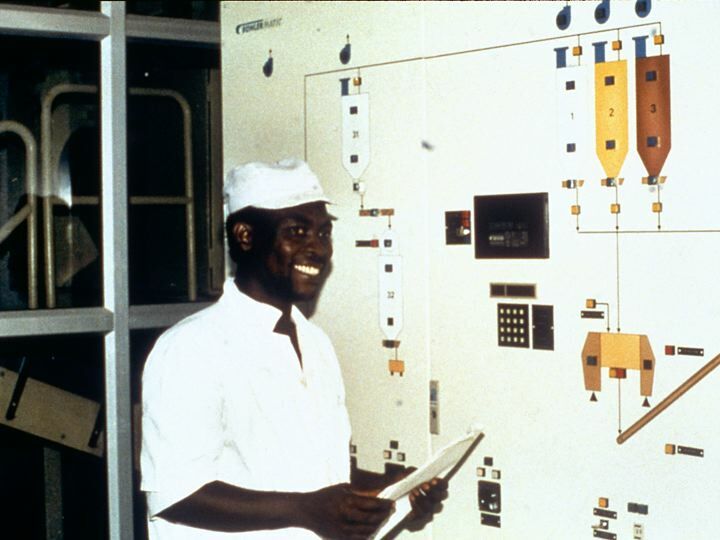 This fermentation process is a hallmark of Ghana cocoa production as it enhances the flavor and aroma of the cocoa. 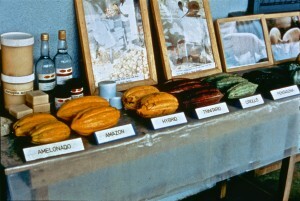 Furthermore, it is a quality benchmark required in order for the farmer to merit top prices paid by Ghana’s Cocoa Board. After the period of fermentation, the beans are spread on large racks to slowly dry in the warm African sun — again, this is slowly reduces the moisture content of the bean and greatly improves the flavor profile of the bean. This drying process, lasting two weeks or more, causes the white film that protects the bean to slough off and the beans take on the lustrous maroon color that most people associate with cocoa beans. 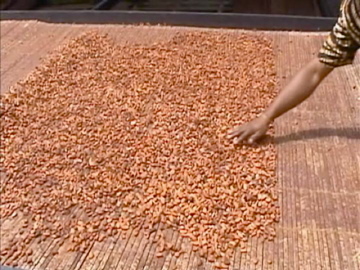 The fermentation and sun-drying processes are not universally used in the chocolate industry. Some chocolatiers — in order to save money and time — mechanically dry the raw cocoa beans, an artificial process that does nothing at all to bring out the rich and subtle flavor attributes of the cocoa bean. Cocoa beans drying in the warm African sun after fermentation. Once the cocoa beans are finished drying, they are graded and then taken to the factory where the beans are crafted into finished chocolate. Raw cocoa beans (after fermentation and sun-drying). The first major process that occurs at the factory is roasting cocoa. It is only after roasting that the distinctive, chocolate aroma becomes pronounced. Prior to this stage, a person with a developed sense of smell will be able to detect a slight chocolate scent but following roasting the aroma becomes nearly intoxicating — beautiful, rich and laden with the heady, euphoric scent of pure chocolate. 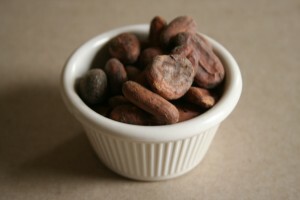 After roasting, the cocoa beans are kibbled or chopped into small pieces called cocoa nibs. 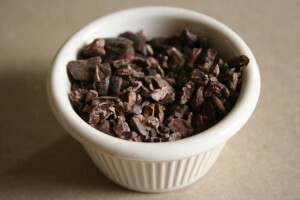 While some people eat cocoa nibs, we are a long way from finished chocolate. Most people who visit our office and are given a chance to inhale the aroma of nibs are nearly overwhelmed by the power of the chocolate aroma — it is almost alcoholic in intensity. Nibs have a rather bitter flavor, however; no real sweetness at this stage of the process. Following the kibbling process, the nibs undergo the grinding process whereby heat and pressure are used to express nearly every drop of liquid inside each nib. Two liquids are expressed: cocoa liquor and cocoa butter. Cocoa liquor is not alcoholic; it is so named because it flows out in liquid form. 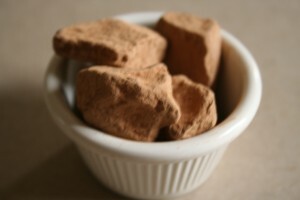 Cocoa liquor is a deep, dark brown color, extremely aromatic with a rich, bitter taste. 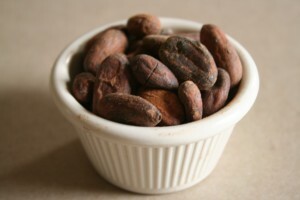 Cocoa liquor can rightfully be thought of as the “essence of the bean”. Cocoa liquor contains over 300 chemical compounds that give chocolate its addictive, aphrodisiac and euphoria-inducing attributes. 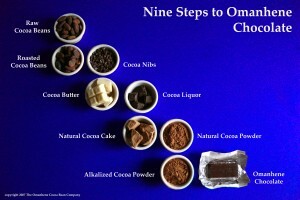 The liquor imparts the distinctive flavor and aroma to finished chocolate. Cocoa liquor, the essence of the bean. 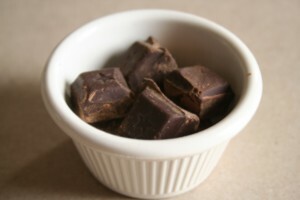 Cocoa butter, by contrast, imparts no flavor or aroma at all to the finished chocolate. It is a fat and imparts the wonderful smoothness — what is termed “mouth feel” to chocolate. Cocoa butter has a very low melting point (it melts at body temperature) and is expressed as a clear liquid that floats to the top of a vessel while the dense cocoa liquor settles to the bottom much as oil and vinegar separate with a clear line of demarcation between the two ingredients. 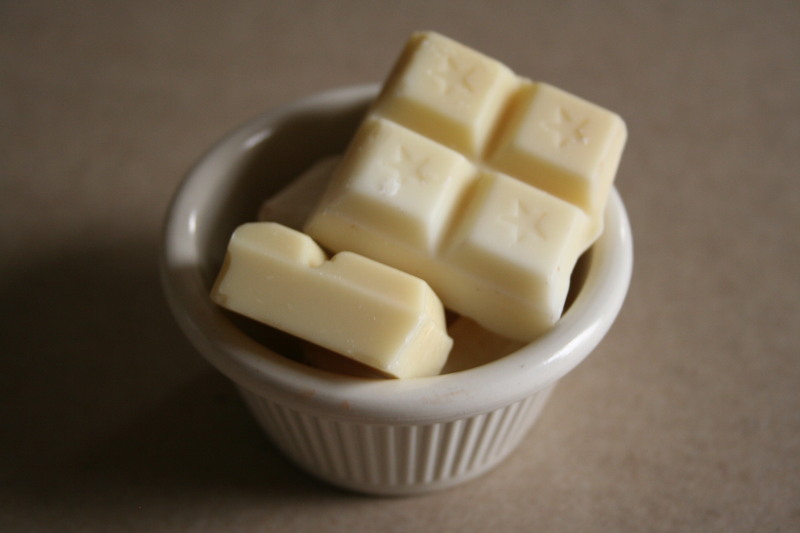 Cocoa butter is often used in the cosmetic industry due to its renowned moisturizing properties. Some chocolatiers substitute other types of fats such as vegetable fat in place of the much more expensive cocoa butter in order to save money. At Omanhene, we use only 100% cocoa butter made from Ghana beans in our chocolate. What is left when all of the liquid in the form of cocoa liquor and cocoa butter has been expressed from the cocoa nibs? The answer is cocoa cake, s chalky, dry material that is pulverized to make natural cocoa powder — they key ingredient in Omanhene hot cocoa mix. 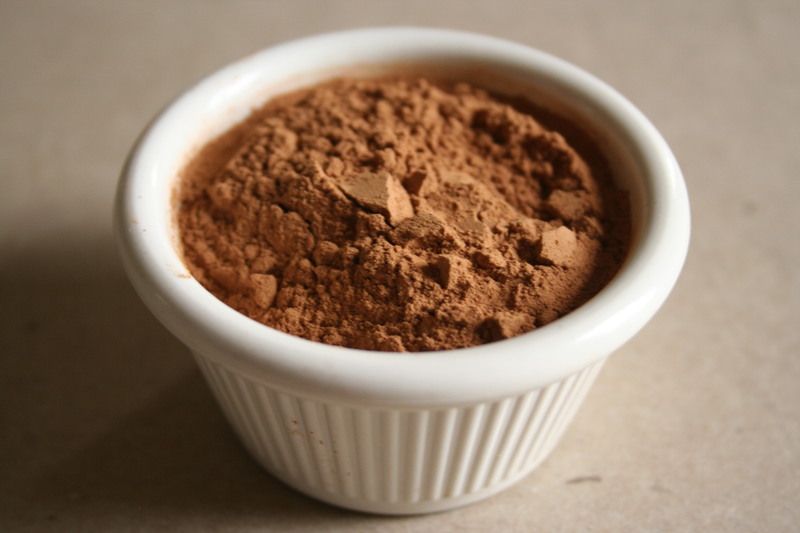 Cocoa powder, used in beverages and in baking, is merely pulverized cocoa cake. So hardly any part of the cocoa bean is wasted in the manufacture of chocolate. Making chocolate is recombining the constituent parts of the processed cocoa bean. Fine chocolate should only have four or perhaps five ingredients: cocoa liquor, cocoa butter, sugar and a miniscule amount (on the order of one-tenth of one percent) of a natural emulsifier such as soy lecithin which acts to bind the cocoa liquor and butter together — recall how they naturally repel each other much like oil and vinegar? 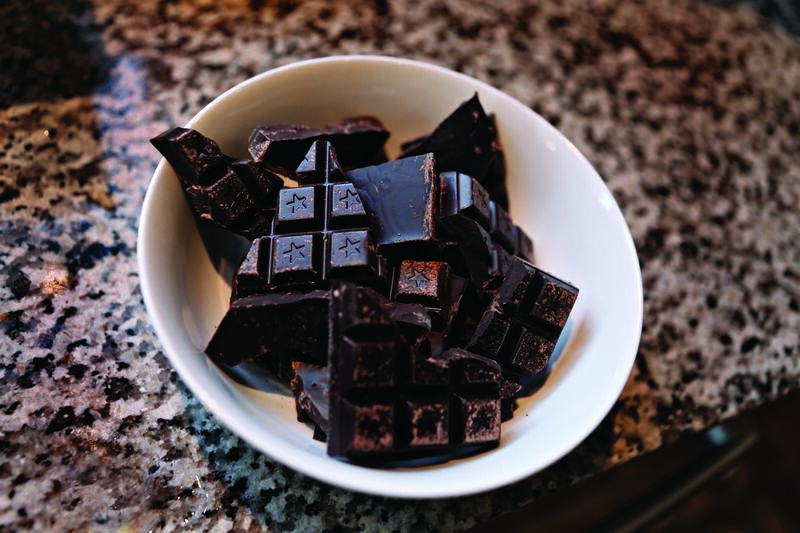 A fifth ingredient — milk — is used to make milk chocolate. We can dispel one misconception about milk chocolate: on labels of milk chocolate you’ll often see a pitcher of milk being poured into a cauldron of burbling chocolate. Liquid milk is not used in commercial chocolate production due to spoilage concerns. Milk powder is used. In our case, Omanhene uses a full cream milk powder. 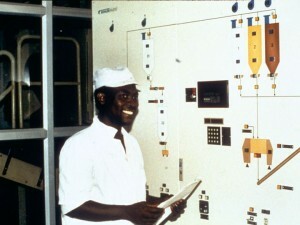 Production technician monitoring the confectionery line. The cocoa butter, cocoa liquor, sugar (and milk powder, if the recipe calls for it) are blended together into what is known as cocoa mass and passed through a series of steel rollers until it is a thick paste. The cocoa mass is then put in a heated mixing chamber called a conche where large stainless steel paddles blend the cocoa mass as it melts to form chocolate. The conching process breaks down the crystal structure of the cocoa butter and cocoa liquor and works to combine these two ingredients — ingredients that naturally want to separate. So the physics of chocolate-making is to overcome the inclination of cocoa butter and cocoa liquor to stay apart. We have to make these ingredients blend into a smooth, rich confection. So fragile are the bonds holding the liquor to the butter that changes in temperature can cause the bonds to break. That is why you should not refrigerate or freeze chocolate nor let it sit where it might be in direct sunlight. All of these situations stress the molecular bonds such that chocolate bloom can result — the unsightly (but perfectly harmless) white powdery coating that can be seen on the surface of a chocolate bar. This is merely the cocoa butter rising to the surface of the bar after having separated from the sugar and liquor. Therefore proper conching is very important to the integrity of the finished product. Conching takes a lot of energy and electricity is expensive so some chocolatiers try to use chemical shortcuts to blend the ingredients as quickly as possible. The exact amount of time that a particular chocolate is conched is often a closely guarded secret of most chocolatiers. In the case of Omanhene, we conche for a matter of days, not hours. After the chocolate is conched it is poured into moulds where it is cooled and then passed through a wrapping machine which folds both a foil inner wrapper and a paper exterior wrapper around the chocolate bar. The wrapped chocolate bar is placed in cartons, then corrugated boxes and is placed in a pre-cooled, temperature and humidity controlled container for shipping abroad. The final product -- Omanhene dark milk chocolate. From bean to bar, manufactured entirely in Ghana; that's the Omanhene difference! Omanhene 80% dark chocolate, chopped.